The most significant news for Week 4 of July 2013 was that Silver Peak announced offerings of hardware customers free, anytime upgrade to virtual - this is a great market-shaker. Latest Oracle Enterprise Manager 12c with cloud management capabilities. Samsung Enterprise ICT seminar to extend new business experience beyond Klang valley. Ninetology launches the U9 Quad-core smart-phone series - the first in the industry. AMD extends embedded SoC leadership by lowering G-Series energy consumption. Fujitsu launches trade-in laptops for Go Green Campaign across penisular Malaysia. Brocade provides foundation for next phase of Indonesia’s Internet growth. Groupon rewarded subscribers to a 'Grouverine Night'. Tata Comms. Q1 FY2014 Consolidated gross revenues up 10% YoY. Oracle today announced the availability of Oracle Enterprise Manager 12c to compliment and deliver integrated management for Oracle Database 12c. Oracle Enterprise Manager 12c combined with the power of Oracle Database 12c’s multitenant architecture enables customers to easily consolidate, clone and manage many databases as one, improving IT productivity by reducing the time needed to perform administrative tasks and providing the ability to quickly identify and resolve issues. through comprehensive diagnostics and analysis capabilities. Samsung Malaysia Electronics Sdn. Bhd. announced their up-coming seminar aimed at showcasing its commitment to innovation and improving business experiences for the B2B market outside the Klang Valley. Samsung will take this opportunity to keep partners and customers updated with the latest Samsung Enterprise product updates and packaged smart solutions suitable for Malaysian enterprises. The “Samsung Enterprise ICT Seminar: The New Business Experience” will be held in Penang on 1 August 2013 at Eastern & Oriental Hotel; Johor Bahru on 22 August at Grand Paragon Hotel; and Kuching on 5 September at Pullman Hotel. CEO Sean Ng said that the trend of smart-phone market is kind of messy and he is bent on helping the cause. First of all, supply is more than demand; secondly there are too many meaningless innovations out there - smart-phones without core idea and culture; and finally he thinks that the market are flooded with products that are too complicated. The U9 smart-phones, despite being the first to launch as a Quad-core smart-phone, attempts to promote a culture that suits urbanites. U9 unites all latest best technology of smart-phone by today’s standard; super AMOLED HD display; HD camera;2200 mAH battery; Android 4.2 jelly bean; and Quad-core 1.2GHz CPU. The combination of all these greatest technology enables it to become the most powerful smart-phone currently - it uses the Quad-core chipset from MediaTek. AMD today announced a new low-power Accelerated Processing Unit (APU) in the award-winning AMD G-Series SOC family with the GX-210JA, further reducing x86 power requirements for embedded designs. The new GX-210JA APU, a full System-on-Chip (SoC) design, uses one-third less energy than the previous low-power Embedded G-Series SOC product while providing industry-leading graphics capabilities. At only 6 watts maximum thermal design power (TDP), and approximately 3 watts expected average power1, this new member of the G-Series SOC family will enable additional fanless designs for a variety of applications ranging from industrial controls and automation, digital gaming, communications infrastructure and visual embedded products including thin client, digital signage and medical imaging. Fujitsu, leading provider of ICT based business solutions and global advocate for environmental awareness, launched its latest Go Green Campaign across Peninsular Malaysia in its effort to promote awareness on technological waste and environmental sustainability. Partnering with major IT retailers across the nation, Fujitsu provides consumers the option of trading in old laptops, desktops, printers, monitors and mobile batteries for rebates on brand new Fujitsu selected laptops in the Klang Valley and Penang. Consumers are entitled to rebates up to RM500 depending on the items they trade-in, which consists of mobile batteries, printers, monitors to laptops and desktops. Desktops to be traded-in must also comply with a complete set of equipment and accessories including DVD ROM, hard disk, motherboard, RAM and processor. Rebates will be calculated based on the condition of the items traded in, with reductions depending on whether the item is non-functional or with a broken screen. The Indonesian Internet Service Providers Association (APJII) has deployed Brocade MLXe-16 routers for the Indonesia Internet Exchange (IIX) to address the growing bandwidth demand in the country which has increased 10-fold in five years, due to growing popularity of online gaming, music and video content, and increased use of smartphones. As a result, IIX was unable to keep up with customer demand. APJII will use the core routers to scale IIX. As the Brocade MLXe-16 core routers can support software-defined networking (SDN) via the OpenFlow protocol, SDN can be applied within the IIX to automatically make efficient routing decisions, detect policy conﬂicts and overcome routing challenges. Built with sixth-generation architecture and terabit-scale connectivity, the Brocade MLX Series successfully meets the increasing traffic requirements and cuts down the cost-per-bit of routing data traffic. Groupon Malaysia recently hosted a special screening of The Wolverine for 200 of its customers as a special thank you for their support and loyalty to Malaysia’s number one social e-commerce platform. (L-R:) Rinah Raflee, Shaidan Shaari and their two kids. 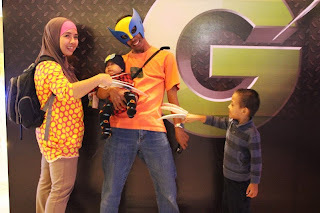 “It is always fun to see how wacky superhero fans can get and were happy to see so many of them joining us tonight. This is just one of the many activities we conduct to express our sincere gratitude for our subscribers’ trust and support and we look forward to discovering even more ways to deliver amazing life experience to Malaysians.” said Rafiq Razali, General Manager of Groupon Malaysia. For snippets of the fun night, please find the photo release and photo captions attached in the e-mail for your perusal. For the high-res images, kindly refer to the link below. Tata Communications has announced its financial results for the quarter ended June 30th 2013.